>>WELCOME GUIDE. OUR WORRY-FREE 18-MONTH WARRANTY, FRIENDLY CUSTOMER SERVICE. 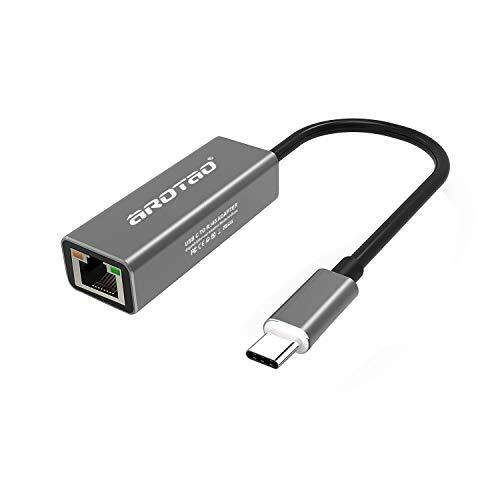 This aROTaO portable USB C to Ethernet adapter connects a laptop or desktop computer with USB-C or Thunderbolt 3 to a router or switch to allow a fast network connection. It is a great solution for those new computers that do not provide a wired Ethernet port or have a damaged Ethernet port. It makes a great companion for your MacBook, Chromebook Pixel, Dell XPS, or other devices. The adapter makes connections easy with its reversible USB-C connector. The USB Type-C connector is smaller and easier to use than previous USB connectors. It's a reversible plug so you can connect to your devices with either side facing up. You can insert the cable the right way every time, so you won't have to worry about the port damage. The usb c ethernet also provides a built-in Gigabit Ethernet port. By connecting a PC, notebook, or tablet to an Ethernet cable, the usb c hub's Ethernet adapter helps deliver fast network speeds for gaming, browsing, and downloading.Perfect for any busy home or office. Access superfast network speeds of up to 1000Mbps and backward compatible with 10/100Mbps, allowing you to transfer a lot of data quickly. Just enjoy the superfast network speeds! Designed with the same minimalist style and aluminum exterior as the MacBook. Premium look and quality with a modern sense. This USB Gigabit network adapter is the ideal laptop network adapter and perfect travel accessory. Weighing just about 1 ounce, it's incredibly compact and lightweight for carrying in your laptop bag. If you have any questions about this product by aROTaO, contact us by completing and submitting the form below. If you are looking for a specif part number, please include it with your message.